Chuck Jarvis Jr. will never forget how giving his father was, how wonderfully he lived his life and just how horribly he died. It’s all part of him now. Jarvis, 37, is a police officer and doting father of two toddlers in Los Angeles, but he also is known as an unabashed supporter of the Pacific Meso Center (PMC), renowned surgeon Dr. Robert Cameron and his staff. Jarvis will be participating for the fourth consecutive year in PMC’s 5K Walk/Hike for Meso on Sept. 27, raising research money to help uncover better treatment options for the pleural mesothelioma that killed his father. Jarvis Sr. died at the age of 63 in spring of 2012, less than eight months after he was diagnosed with mesothelioma, the cancer caused by exposure to asbestos. Cameron couldn’t save him, but he never stopped trying. He helped the family understand and cope with the disease. Even though Jarvis Sr. was only weeks from dying, he was the driving force behind PMC’s first Great Escape Motorcycle Ride, another fundraiser that has become an annual event. 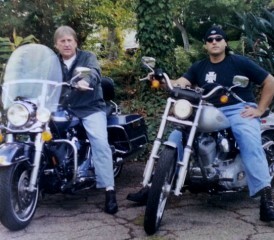 Jarvis Jr. still rides in it every year — on his father’s vintage Harley-Davidson. 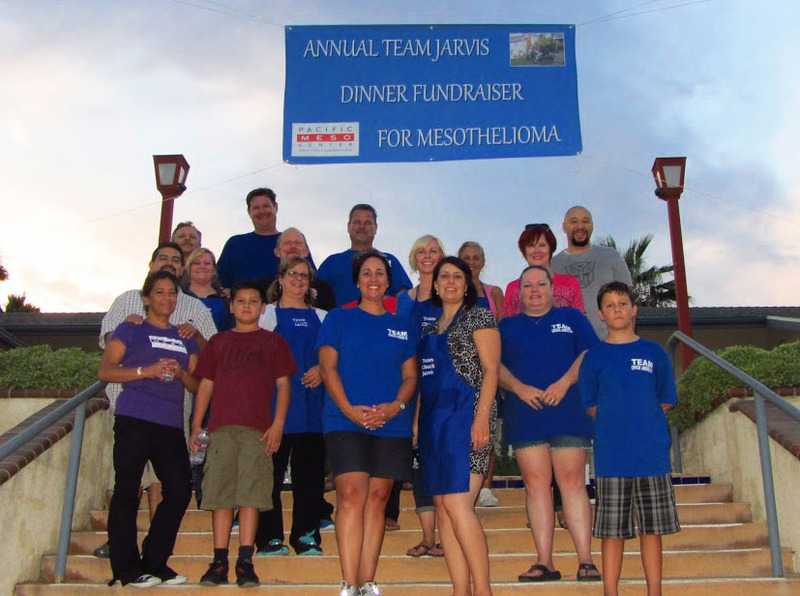 Chuck Jarvis gathers with family and other team members to raise funds for mesothelioma research. Daughter Sonia Jarvis, with help from her mother, now hosts an annual Team Jarvis Pasta Dinner for Mesothelioma to raise money for PMC research. What started at her parent’s home now takes place at the Community Christian Church to accommodate the growing crowd. His wife, Sonia Jarvis, contributes regularly to PMC fundraising efforts — large and small. Jarvis Jr., despite his own busy schedule, speaks regularly to small groups on behalf of PMC to raise awareness. PMC was formed in 2002 with the goal of becoming the most innovative research and treatment center in the U.S.
Jarvis Sr. was a U.S. Navy veteran who served in Vietnam. After returning home, he settled in San Pedro, a tightly knit, working-class community in Los Angeles. He worked on cars, roofs and later for the city of Los Angeles, always finding time for family, friends and neighbors in need. He was always the one who helped with the plumbing next door, or rewiring the electrical circuits for the retired couple across the street. He was the one who changed the tire for the lady three doors down. He came home from work, but he never took off his work belt. And he never charged anyone. Local kids whose own parents were too busy also learned to ride their bikes thanks to him. When he took his children camping, he brought their friends, too. It was never a problem. He always brought the charcoal grill for the neighborhood barbecues and served as the cook. Everyone knew who he was. He instilled pride in his children and a willingness to give of themselves to help others. His family was there for every doctor’s visit he made in the last months of his life. As a police officer and former college football player, Jarvis takes pride in his ability to read people and their motives. It’s why the support has remained so strong. The PMC is hoping to eclipse last year’s $100,000 raised and 260 participants in the 5K Walk/Hike at the Paramount Ranch in Agoura Hills. It will include lunch and a drawing for prizes such as dinners, and entertainment and adventure certificates. The grand prize is a photo safari for two in South Africa. Most of the participants will be family and friends of those who have been touched by mesothelioma. Many come from Jarvis’ old neighborhood, where he left his mark.